After an outstanding season and impressive NBA Playoff run, Kevin Durant and the OKC Thunder were recently eliminated by the Memphis Grizzlies in the Western Conference Semifinals. Although Durant’s no longer in action, his signature sneakers with Nike have been some of the most memorable kicks of the court in recent years. Designer Leo Chang has handled the majority of the Nike KD projects with healthy amounts of input from Durant himself. Priced considerably lower than many of the market’s high-end basketball sneakers, the Nike KD line has been an affordable and high-performing option since it first hit the market in 2009. Take a look back at The Complete Tech History of Kevin Durant Signature Sneakers. 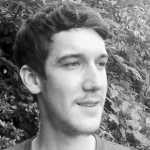 Riley Jones is a student from Charlottesville, VA. With an unshakable affinity for basketball and all things ’90s, he can be found on Twitter here. 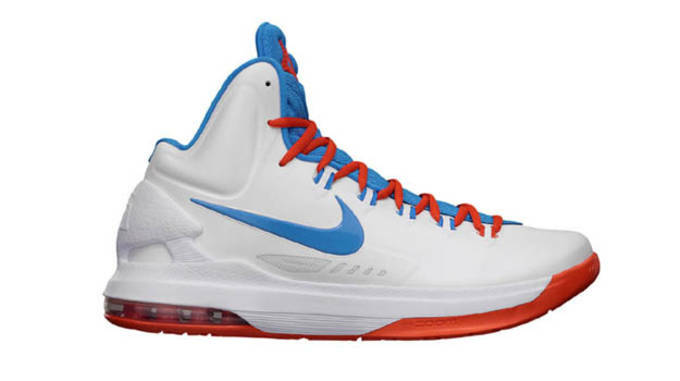 In just his third season, Durant won the 2010 NBA Scoring Title while wearing the Nike Zoom KD2. 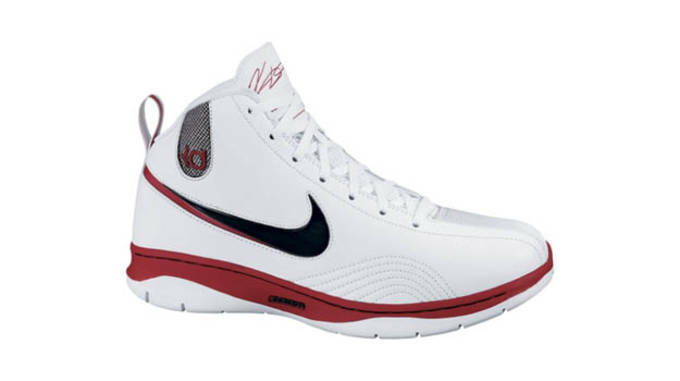 Building from the silhouette of the KD1, the Zoom KD2 carried over a similar profile and Zoom Air cushioning. For quick, explosive big men who play on their toes like Durant, forefoot Zoom Air is one of the best cushioning options available. A Phylon midsole added further platform support, while a midfoot strap was added for a snug, lockdown fit. 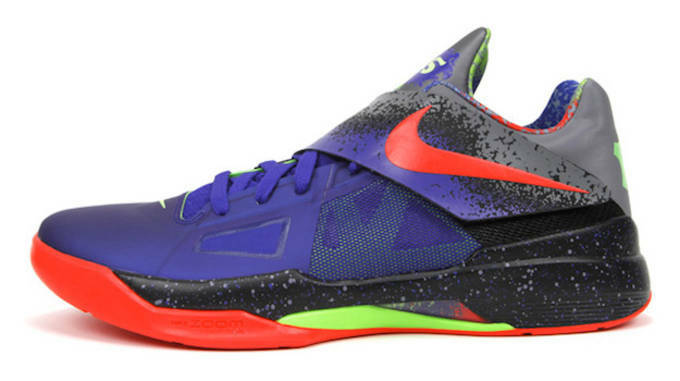 The Nike Zoom KD III was yet another high-performing model with a stress-free price tag at $85. From the jump, you&apos;ll notice that the KD III has eliminated the midfoot support strap and has a noticeably lower cut than its predecessor. Much of the tech utilized in Durant’s third Nike sig, like forefoot Zoom Air and Phylon cushioning, was what he’d grown accustomed to. 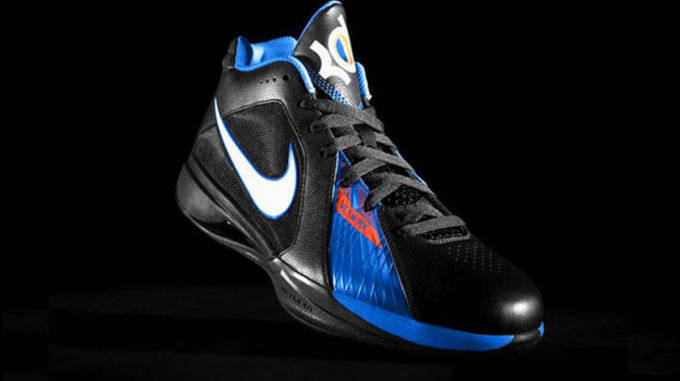 New to the KD line was the inclusion of Flywire on the leather and synthetic upper. Strategically placed in high flex areas, this addition helped provide added durability and support to the speedy model. Flywire and a low profile helped to knock the weight of the KD III down to 13.5 oz, making it the lightest model in the Nike KD line at that point. It’s also worth noting that the Zoom KD III was the first Durant signature model available for customization on Nike ID, allowing players of all levels to match with their team’s colors. 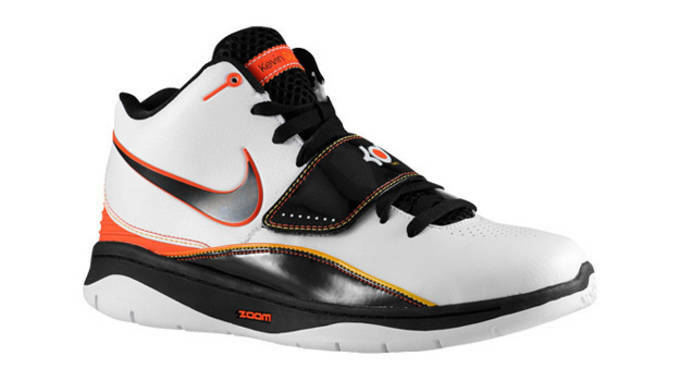 After ditching the midfoot support strap from the Nike KD II, the concept was re-worked in the form of the Adaptive Fit System for the Zoom KD IV. The Adaptive Fit System features synthetic straps at the forefoot and arch, which attaches to the midsole and laces for an interconnected lockdown fit. 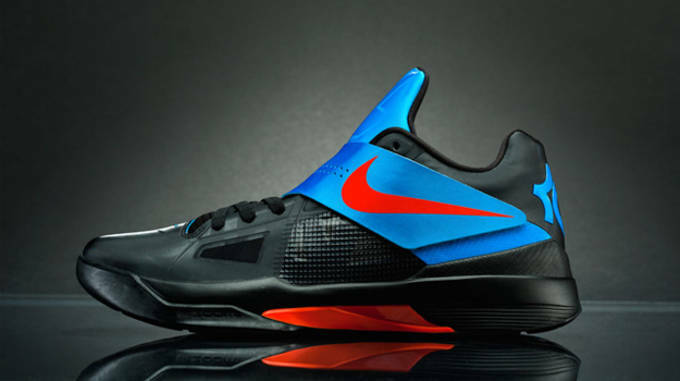 Switching over from a leather construction, the KD IV’s three-layer Hyperfuse upper offered improved levels of ventilation and durability. Zoom and Phylon are once again utilized for bouncy, responsive cushioning. Aesthetically, the jump from the Zoom KD IV to the KD V was one of the most dramatic of the series. However, when it comes to the inner workings and technology utilized, many elements remained the same. The vented Hyperfuse upper returned, this time with a higher ankle profile and integrated lacing system. The addition of a heel clip which is fused with the midsole provides extra support and lockdown. Meanwhile, KD’s preferred forefoot Zoom and Phylon combination was beefed up with a sturdy heel Max Air unit. After lacing LeBron and Kobe with postseason-specific Elite models last year, Nike gave Durant the attention he deserved in April with the Nike KD V Elite. Sporting a much lower ankle cut than the standard KD V, the KD V Elite was built to be Durant’s quickest and most durable model yet. 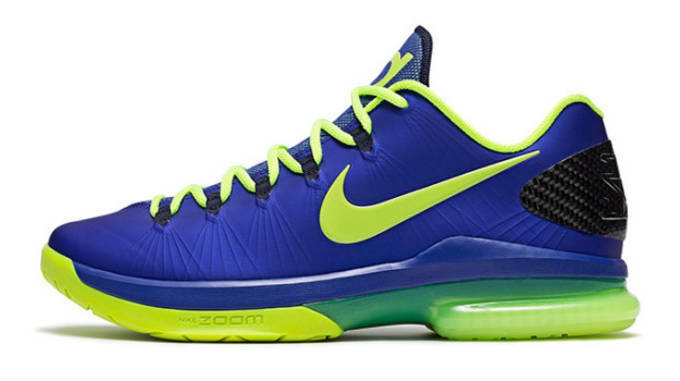 Forefoot Zoom Air returns, but the Max Air of the KD V is swapped for Caged Zoom Air. The heavy-duty Hyperfuse upper is supported by Kevlar-enforced Flywire cables, while a heel Carbon Fiber counter provides snug stability in big game situations. Due to the addition of advanced tech such as Kevlar and Carbon Fiber, the Nike KD V Elite retails at $180.